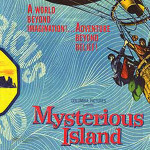 Review of Ray Harryhausen’s classic version of Jules Verne’s Mysterious Island (1961), new on Blu from Twilight Time, plus thoughts on three perfect fantasy classics. Sinbad on Blu – Double-Time! Today’s offering are two Ray Harryhausen treats on Blu from Twilight Time: The Golden Voyage of Sinbad (1972) and Sinbad and the Eye of the Tiger (1977), plus details of the next imminent wave of reviews.